In addition to our official PCAS field trips, Tim O’Connell will be leading multiple bird walks this spring for the OSU Ornithology class. All are free and open to the public. Sunday, 17 Feb: 1:00 pm, Couch Park. For more information, check out the pages for Field Trips and the Great Backyard Bird Count. Beginning 2018, we are moving to just two evening meetings per semester (we normally track the school year) and placing greater emphasis on field trips. We will also spread the location around three different Stillwater venues, so please be sure to check here for locations. 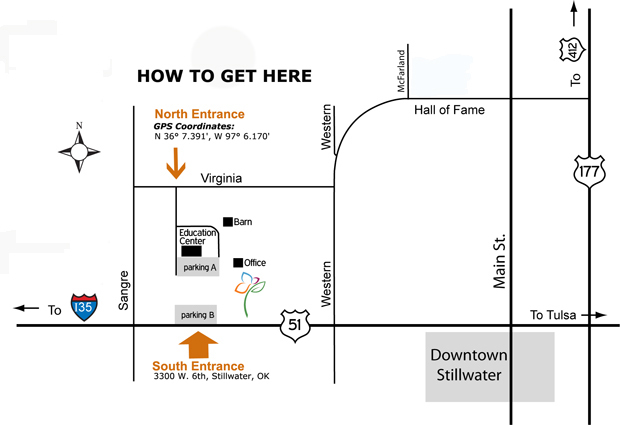 Thursday evening meetings and presentations will be held in the Education Center of the Botanic Garden at Oklahoma State University, at the Stillwater Public Library, and at Hideaway Pizza. Visitors to the Botanic Garden can access the grounds via the South Entrance on Rt. 51. Better for evening programs, we will arrange to have the gate at the North Entrance (accessed by Virginia Avenue) open after hours. Parking will be available in lot “parking A” on the above map. Stillwater Public Library, S Duck St. The Stillwater Public Library is located at the corner of 12th Ave. and South Duck Street.